Are there scripts to reset the morph values for each sound individually and globally ? I'm not 100% sure what you mean. In Microtonic (unlike on the PO-32) the morph is always global and affects all sounds. Are you looking for an easy way to eliminate the morph effect on certain drum channels? Easier than copying the drum patches and paste them on both edges of the morph slider (100% left and 100% right)? 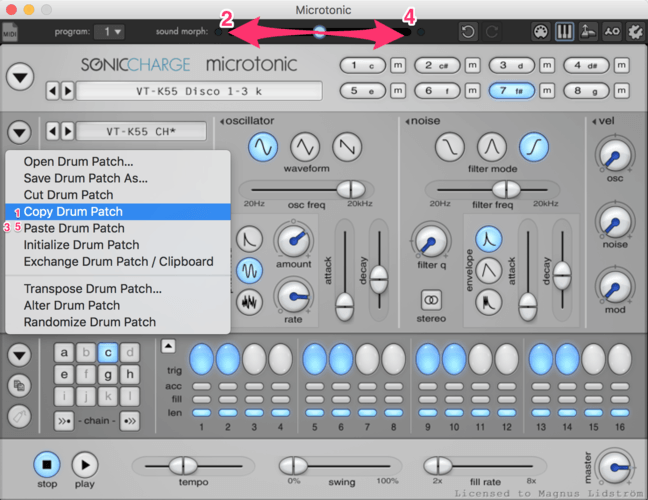 Yes, an easy way to eliminate the morph effect on certain drum channel and globally for all drums channels. I don't understand the procedure "copying the drum patches and paste them on both edges of the morph slider (100% left and 100% right)"
Not a bad idea with a script though. I'll see if I can cook one up.